Sword Art Online is an anime with a great first half plagued by a mediocre second half. Luckily, Sword Art Online II does not suffer from a similar affliction. Vastly different from its murder-mystery first half, SAO II ends strong with a powerfully human tale that serves as the emotional high point of the franchise. 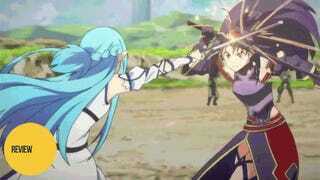 The setting of Sword Art Online is one of infinite possibilities. As each virtual world can be different from the next, it allows for stories of many different genres. Utilizing this is perhaps the franchise’s greatest strength. The first arc is a death game story, while the second is a classic hero-must-rescue-the-princess tale. The third arc in turn is a cyberpunk murder mystery. And most recently, the final arc of Sword Art Online II has two additional stories: Caliber—a lighthearted adventure—and Mother's Rosario—a bittersweet coming-of-age story. So let's look at those last two, one at a time in a bit more detail. When it comes down to it, Caliber has one major purpose in the overall anime—it provides some much needed breathing room. Between the tense life-or-death mystery of Gun Gale Online and the upcoming emotional drama of Mother's Rosario, the series screams for some downtime. Thus Caliber follows the full cast of Sword Art Online's first three story arcs going on an adventure together. Their quest is one any MMO player can empathize with: the insatiable need for more loot—in this case the legendary sword “Excaliber.” But as they find out, there is more to their quest than simply obtaining the sword. If they fail in their mission, ice and snow could overwhelm the world of ALfheim Online and the World Tree itself could die as well. So Caliber is a story with stakes, but comparatively minor ones: If they fail, there will be various effects seen in the game world, but nothing more than that. No one's life is on the line, there is no murder to be solved, it's simply a group of friends playing a game together. And that's really where Caliber excels. We have rarely seen the whole group together playing off one another. 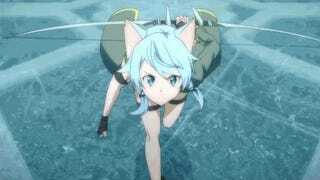 Sinon and Leafa were the main heroines of their respective arcs but were largely isolated from the rest of the original gang. Then, once their stories were done, they became background characters on par with Lisbeth and Silica (who only had an episode each to begin with). Caliber gives them and the other characters more time to shine as part of an ensemble cast. It really is little more than a fun adventure—a way to decompress before getting into something as heavy hitting as Mother's Rosario. Unlike the rest of Sword Art Online, Mother's Rosario is not Kirito's story. Rather it is the story of Asuna, as she struggles to adjust to the real world, and Yuuki, a young girl hiding a terrible secret. While each is facing problems far different from the other, their evolving friendship and what each gains from the other is not only the emotional crux of this story but the driving force behind the plot as well. In the first arc of Sword Art Online, Asuna was a strong fighter and one of the leaders who thousands depended on to get them through the death game alive. In the second arc, she was powerless, locked in a literal bird cage and molested by her captor while waiting for her hero to rescue her. In Gun Gale Online, she was little more than a spectator cheering on her man. And even in Caliber, she was just another member of the ensemble cast. In Mother's Rosario we finally see what life is like for Asuna after escaping Sword Art Online. She is almost treated as having a handicap by her family as she is two years behind her peers and thus out of the running for gaining prominence in her wealthy family. Her mother in particular is aware of this and is determined to get Asuna back on track for professional success—through better schooling and an arranged marriage if needed. Thus, after all she has gone through, Asuna once again finds herself in a cage—finding that the most freedom she ever had was when she was trapped in a death game. Reconciling who she is in the game world and who she is in the real one is the core of her character development in Mother's Rosario. But while alone she flounders in this, it is by befriending Yuuki that she is finally able to grow. Yuuki, on the other hand, is a person with a simple, yet seemingly impossible goal: to beat a raid boss with just seven people. To do this, however, she'll need not only the best of the best but also someone who will work well with her tiny guild of six. While wholly steadfast in her goal, she remains a perpetually happy girl, friendly in the extreme. But there is also a sense of mystery about her and her small guild, especially as it is revealed that Yuuki is a faster swordsman than Kirito and has even beaten him in a duel. Yet, despite this, Kirito is certain that Yuuki is not a survivor of Sword Art Online. And by about half way through this arc, Yuuki's mystery becomes the central conflict of the show. [Skip to the next section to avoid spoilers.] Of course, the big reveal is that Yuuki is dying—everyone in her guild is. They are terminally ill patients with virtually no chance of recovery. To live the remainder of their lives without pain, they spend most, if not all, of their time in virtual worlds. Yuuki is only 15 years old. She's only getting started in life yet death within a few months is a certainty. She's already lost her entire family to AIDS, leaving her the final survivor—which leaves her in an existential crisis. What is the meaning of her life? What impact has she or will she make on the world? Like with the classic Beowulf, Yuuki finds her meaning and immortality in the written word. For her, having her name (and those of her soon-to-pass-away friends) on a virtual wall for all eternity is proof that she existed. To her, even that is enough. Yet through her friendship with Asuna, she gets so much more. She makes friends, is able to attend school, and even returns to her old neighborhood. In the virtual world she becomes famous, proving to all that she is the most powerful player to ever play the game. So when she finally dies, it is not alone or with a small group friends at her side that she passes away—but rather in the company of thousands. Yuuki was able to leave her mark on the world and in the minds of those who inhabited it; and she dies fulfilled. The second half of Sword Art Online II makes for some fantastic anime. Caliber is simply a fun adventure. Removed from the life-or-death stakes that often permeate the franchise, it provides the characters some downtime where they can simply have fun and enjoy each other's company. Mother's Rosario, on the other hand, is a heartbreaking character piece about two girls who form a friendship that changes both of their lives forever. Take those two stories, add in some excellently choreographed action, and you have an anime that is easily one of the best of 2014. Sword Art Online II aired on Tokyo MX in Japan. It can be viewed for free and with English subtitles in the US at Crunchyroll and Hulu.